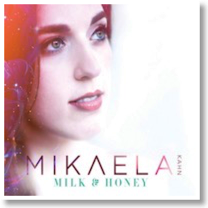 Austin based singer-songwriter Mikaela Kahn recently released her debut album, Milk and Honey. The album brings many different styles of music together in a unique mix, which gives many audiences a taste of softer and easy listening music. Her career is just beginning, but this young singer brings a fresh new voice to the music scene. In this interview she talks about her music and singing. Caroline LaMotta: When working on your album, Milk and Honey, did you draw inspiration from any other artists? Such as from their singing or musical style? Mikaela Kahn: Yes, definitely! I love to listen to other artists during my writing process to draw inspiration. While working on Milk & Honey I was listening to a lot of pop/r&b artists - especially JoJo, Travis Garland, and Frank Ocean. I love their melodies, & rhythmic concepts as well as their honest, straightforward lyrics. I used those ideas as a jumping off point for many of my songs. I also got a lot of inspiration from their thick background vocals when adding backgrounds to my songs. Was there anything challenging in creating Milk and Honey that helped you become a better artist? While writing for Milk & Honey I really challenged myself to write from personal experience and avoid too much editing. I tend to be a real perfectionist when it comes to my music and sometimes I need to remind myself to just let things go and let the music dictate to me what it wants. Rather than trying to shape it into something “perfect”. That is still a constant challenge for me, but I’m always working on balancing my desire for perfection with allowing the music to be organic. Your singing and music is diverse, how would you describe your music? And where does your love of music come from? I have always loved music. I remember sitting for hours on my computer as a kid making mixtapes for all my friends and compiling huge lists of all the CD’s I wanted to buy. I’ve always had a very eclectic taste in music and I still go through phases of what I like to listen to. I’ll go months only listening to gangster rap, then folky singer-songwriter music, then bluegrass. I love throwing my voice into different styles of music and with my writing I’m constantly just trying to create the most honest, interesting, beautiful music that I can. What did you find most enjoyable in creating Milk and Honey? What was the recording process like for you on this debut release? My favorite part about creating Milk and Honey was working with my producer and friend, Justin Shelton. I just love his ears and creativity and it was so great writing with him. I trust him fully and we both put our hearts and souls into this project. This was my first experience really co-writing with someone and I don’t think I’ll ever go back to writing alone again. Fire & Lace was a special song for me because it really embodied what I was trying to do on Milk and Honey. It’s a mix of beautiful sounds, unfiltered lyrics, and interesting melodies. Also it just feels good to me. I thought it would be a good opener for the album and would get the listener’s ears ready for what comes next. As you continue to write new music, how would you describe your songwriting process? Is there a set time you write? My songwriting process is always a little different. Sometimes I’ll start with the lyrics first or just a portion of a melody and go from there. But lately I’ve started a new writing regimen. First thing in the morning I go to a local coffee shop and do a few rounds of object writing (free style sense-driven writing based on any theme) for about a half hour. That keeps my mind sharp throughout the day and gets my creative juices flowing. When I sit down to write later in the day I already have ideas to draw from. Plus I’m caffeinated. Have you thought about a special album you would like to do next? Yes! Right now I’m actually working on a new duo project “Beth James” that I’m very excited about! I’ve been co-writing a ton with Jordan Burchill (of The Rio Grande) and we hope to put out an EP sometime this Winter. The music will be a collaboration of both of our styles and will have some pop, indie, folk, and r&b elements. If you’re still reading this please go follow us on our new baby social media accounts (@bethjamesband)! In your spare time how do you relax? Do you have a hobby, read - which books are you reading now, or like to travel? I love to bake, read, go to the movies, spend time with friends, travel, and craft! I just finished re-reading a fantastic book series “The Magicians” by Lev Grossman. I highly recommend it if you’re into magical things. Also I’ve started a routine lately where I go to the movies every Sunday night. I’ve seen almost every movie in theaters right now and it’s awesome. Such a fun way to relax and chill out.